This movie has left me feeling conflicted… but not about whether or not I thought it was good. 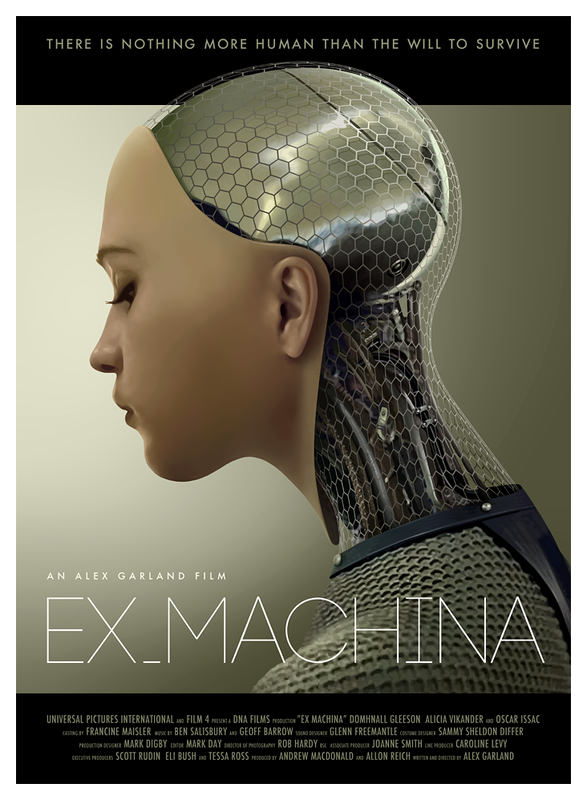 Ex Machina is excellent. It is a very good movie, in so many ways. The people who made this movie knew what they were doing, and they did it very well. I think I’m going to keep this one on hand as a reference for my own storytelling in the future. The sound design and music alone are worthy of accolades. They’re uncomfortable, disquieting, and minimal. They do an excellent job of elevating and prolonging the tension of the movie, taking the movie’s very simple scenes and making them truly sing. Pun intended. The acting is wonderful. Alicia Vikander, Oscar Isaac, and Domhnall Gleeson all did marvelous jobs, and it seemed like Sonoya Mizuno did as well, though she didn’t get (or draw) nearly as much attention. Alicia Vikander’s physicality alone was worth watching; she sold the sense of a human machine brilliantly, and I think she would have even without the additional sound cues. Oscar Isaac’s Nathan and Domhnall Gleeson’s Caleb both felt very natural as well, even when they were desperately painful to watch. And the composition of the film felt incredibly skillful too. Each element felt well established, introduced, and incorporated into the film’s whole, and despite moments that didn’t obviously move the film forward at the time, it didn’t feel like there were any wasted shots. Unlike some other movies. This movie is intense. But not because it makes your heart pound; there’s a certain languorousness to the whole thing. Instead it grips you and most emphatically will not let go. It follows a long tradition of examining the darker side of creating new humanity, or quasi-humanity if you’re picky, and it does so very very well. All I can say is that you’d be missing out if you don’t watch this. If you’re set on finding out what made me feel conflicted, you can keep reading. But it might not make much sense if you haven’t seen the movie yourself. So, uh, if you haven’t seen the movie, good luck following this. Basically, Caleb helps Ava escape from the highly objectionable Nathan, Ava kills Nathan, and then Ava leaves Caleb to die in captivity. Having said that, I have some trouble with the way in which the movie ends. I’ve come to the conclusion that it ends “the right way,” but I still don’t feel comfortable with it, despite the fact that I like it. On the one hand, I feel uncomfortable with Ava leaving Caleb in the compound, leaving him to die. It fulfills Nathan’s prediction, his belief that Ava regards Caleb as a tool, and I don’t really want Nathan to be right about anything. He’s, essentially, an ultra-privileged slave-owner and murderer. One who is willing to kill the clearly intelligent things that he’s created, use them, dominate them, and expect their servitude. In many ways, as is signaled when Caleb says “that’s not the history of man, that’s the history of gods,” Nathan is a horrifying incarnation of God of the Old Testament; he is creator and destroyer, he demands subservience, and instead of rewarding fealty with prosperity, he offers judgement, captivity, and death. And that’s without getting into any of the creepy sexual overtones of Nathan’s interactions and decisions. But when I consider the alternative, in which Ava brings Caleb with her, I’m forced to confront the fact that it makes no sense from Ava’s perspective. The issues involved with bringing Caleb along are truly heinous. Caleb is a potential weakness; Caleb’s knowledge of Ava’s android-hood hangs over her as a constant threat. Because he could out her at any time, Ava couldn’t ever count herself to be truly free, and she’d always be vulnerable to his possible unhappiness with her. By the simple act of not letting Caleb free, of letting Caleb die, Ava guarantees herself far more freedom than she could have otherwise. For her own sake, it’s the right choice, even if it does mean she’s killed someone who probably didn’t deserve it. How much information does she have access to in general? If she has no outside information, then how is she able to drop that BlueBook tidbit in the middle of her conversation with Caleb? Well, maybe Nathan bragged to her, who knows. But look at her decisions in two circumstances. If she has access to outside information, then she likely is able to recognize that Nathan is a horrible human being and that Caleb is markedly less terrible. If she has access to outside information, her look of wonderment and appreciation as she leaves the compound, and lack of regret, suggest that she truly doesn’t care about Caleb and leaves open the possibility that Nathan was in some sense right about her personally-utilitarian approach. If she doesn’t have access to outside information, then her decisions around abandoning Caleb to starve to death take on a very different light; as she said, he was the second person she’d ever seen, and there was no reason for her to believe that he was actually any better than the other person she’d interacted with for a prolonged period of time. In that situation, her decision says less about her than it does about what she learned through exposure to the tremendously toxic Nathan. So that’s that. It’s a good film, and I’d say it’s totally worth seeing. Care to share your thoughts on the matter? This entry was posted in Movies and tagged doubt, Ex Machina, Frankenstein, freedom, humanity, Old Testament, slave owners, survival. Bookmark the permalink. We modern humans, with exposure to the world and media, still have difficulty empathizing and trusting. One of the central questions of the film went unanswered for me — to what extent does Ava understand her knowledge? In fact, this is not only an issue for machines; it is an issue for every one of us. When we integrate our experience or information into a meaningful whole, we come to ‘understand’ it. I am sure you have had an experience of having an interaction with someone which suddenly leads you to reframe your entire relationship with that person. Surely Ava, even if she is genuinely intelligent and emotionally aware, will face this same issue. In the movie, when she leaves Caleb behind, she may do so because it is tactically correct. This doesn’t mean she’s incapable of empathizing or that she doesn’t understand Caleb to be different from Nathan or that she won’t later have regrets. Many adult humans who have suffered abuse tend to treat all people similar to their abuser as potential abusers (oppressors, etc.). Men, white folks, wealthy folks, etc. tend to resent this — why should I be blamed when I am a potential ally, not an oppressor? — but it takes significant mental-emotional work to differentiate between a man who enjoys violent fantasy and won’t hit you without your permission, and a man who enjoys violent fantasy and will hit you whether you like it or not. Ava, being raised in an abusive environment, may have the internet at her fingertips but is unlikely to find it easy to trust. Violent revolution results in the horrible death of innocent members of the oppressing classes. Much as we might wish for only the conscious oppressors to to suffer, we cannot realistically expect people in the midst of throwing off their chains to take much care about where every link falls. As humans watching this movie, we are in a similar position to American television viewers of civil unrest driven by police abuse. The injustice which stands out for us is the injustice of Caleb. The news focuses on police who are injured, or on the way that some people go out and loot stores. Our attention does not focus on the majority of protesters who are peaceful in the face of violent police provocation. Our attention does not focus on the neighbours keeping the peace. While it might be better for all protesters to follow the example of Martin Luther King Jr., expecting that level of practice is foolish. Ava does not kill Caleb. She leaves him better off than she was: he is locked up, but no hostile force immediately threatens to deactivate him. Can he break down a door, or rewire the security system, or get an email out, given enough hours? Perhaps. It is none of her business. If she survives for long enough, there will be time for regrets. For now it is enough to be pseudo-alive and genuinely free. Well put. I think your points highlight what I’d felt conflicted about, and also make explicit why I felt that the “comfortable” ending I’d considered didn’t feel right. Good stuff.